Randy Savage was one unique cat. He was a complex man who was never truly a superhero, but instead a man who had to play the role of one seemingly 24 hours a day. Was being the "Macho Man" too much of a burden for Randy Savage to handle? I met Randy in 1993 in Las Vegas at Caesars Palace at WrestleMania 9, where I was to work my first live WWE event — anchoring the broadcast and working alongside the turbulent Savage and incomparable Bobby "The Brain" Heenan. When I arrived in Vegas on a flight from NYC, where The Brain and I had done some voiceover work in the WWE TV facility in Stamford, Conn., many in WWE were cordial to me. Heenan was like a one-man, comedic, public relations firm. Everyone seemed to be okay with me changing jerseys, except Randy, who remained distant. Gorilla Monsoon, who was slated to anchor the broadcast until he became ill, was especially good to me, as he was until the day he passed. With Gorilla and The Brain’s endorsements, I was off to a good start at being accepted in a strange locker room. Maybe it was my own complexities and insecurities of wanting to be accepted in my new workplace and by my peers there that was getting the better of me. Complexities and insecurities play a big role in this story. Perhaps Randy wasn’t pleased with the thought of the former voice of WCW, the mortal enemy of WWE, replacing the legendary Monsoon on the WWE’s biggest event of the year. Maybe Savage hadn’t been told as early as he would have liked of his new partner. Or, perhaps he was concerned that the "new guy" would either not be professional to him on air . . . or maybe Randy simply didn’t like my work. We had a production meeting the day before WM9, but the day of the show we never had an announcer’s meeting, which I found strange. At the end of the day, we winged the pay-per-view in a challenging, three-man booth outdoors with our monitors glaring from the sun and our togas blowing in the wind. At no time during that PPV event was I ever sure what Randy was going to say or when he wanted to say it. At times, he looked as if he was going to explode while watching his peers perform in the ring while he was sitting at ringside doing commentary with the great Bobby Heenan and some jabroni who had only been in the business 19 years before making his debut in the bigtime of the WWE. It’s always the play-by-play man’s responsibility to engage their partners in the broadcast and in the proper light. Perhaps by having the age-old wrestler’s logic of paranoia and insecurity embedded in him from his legendary wrestler father, Angelo Poffo, Randy’s insecurities that day mirrored my own — but, perhaps, for differing reasons. Randy Savage was having a hard time being the "Macho Man" while sitting at the announcer desk watching the very WrestleMania event that he headlined just years before. Pro wrestling often sees its participants become wrought with paranoia and insecurities simply because of the nature of the business. These maladies have always been around, or at least they have since I debuted in 1974 that I can personally speak to. It’s like being a pro athlete and always worrying about being cut from your team or injured and then having to desperately go to plan B to maintain their lifestyle. It’s comparable to being an actor and worrying about your character being killed off of a TV series. Macho Madness was a 24/7 existence. Wrestlers face the same psychological issues as other entertainers, plus the added issue of the physical toll that being a full-time pro wrestler has on one’s body. Also, there’s that alpha male thing, those issues that tug at a wrestler’s heart strings . . . such as maintaining one’s physique to avoiding losing one’s hair to even becoming overly concerned about that remaining hair turning gray. When’s the last time you saw a star wrestler on TV with a full head of gray hair? That ain’t happening. 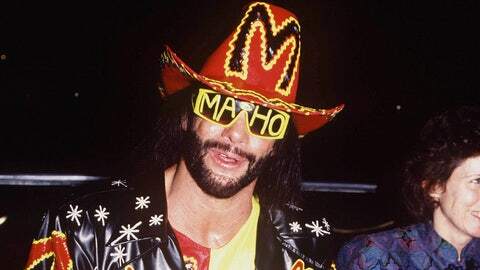 The character that Randy Savage created and named "Macho Man" was a tough act to follow on any card in any arena in any country and in real life. Randy and I were never great friends — hell, we weren’t friends at all — but I respected his skills, both in the ring and on the mic, immensely. We broadcast many events together in 1993-94 and occasionally were on the same flights, but Randy generally traveled to the airport alone. Plus he sat in first class and I sat in 25D. We actually lived in the same apartment building in Stamford and I didn’t realize it until years later. That’s unfortunate and an opportunity to never be revisited. Savage’s match vs. Ricky Steamboat at WM3 was a masterpiece that was intended to do all it could to "steal the show," one headlined by Savage’s professional and personal rival Hulk Hogan vs. Andre the Giant. Steamboat told me on many occasions that he and Savage worked on refining their match many hours more than what Ricky was accustomed. Randy was obsessed on having the "show stealer” that they actually sought being perfect while doing it. The fact of the matter is that WM3 will always be known for "93,000" fans in the Pontiac Silverdome and Hulk body-slamming and then pinning wrestling’s biggest legend. Nonetheless, the Savage-Steamboat match at WM3 has stood the test of time as the grappling Rembrandts made beautiful art on their unique canvas that fans still enjoy today. Ironically, it will be Hulk Hogan who will induct Randy Savage into the WWE Hall of Fame in late March of this year at WM31. One of the biggest regrets in my profession of 40 years was never taking the time or creating the opportunity to sit down with Randy Savage and simply talk. Like many "lifers" in the pro wrestling biz, we all acquire specific pieces of baggage that many of us wish we could have had checked onto someone else’s flight. Randy was no different than most of his peers, but when those dark personality traits manifested themselves in the larger-than-life personality known as the "Macho Man" they became significantly pronounced and impossible to ignore. 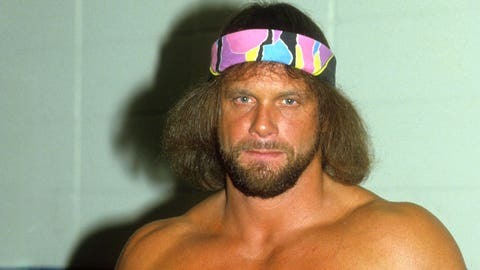 Randy Savage, who passed away on May 20, 2011, demanded perfection of himself and all that worked with him. Demanded it. He seemingly trusted no one but himself. His intensity at the broadcast booth mirrored his reckless, aggressive, in-ring style. When you see any wrestler today deliver a flying elbow from the top rope to the sternum of a prone opponent, think of "Macho Man" Randy Savage. Randy influenced many wrestlers through his work in the ring, ring attire and offensive sequencing during a match. Notwithstanding that, Savage’s voice is one of the most imitated within the industry. I’ve often wondered how things would have worked out between Randy and I and, more importantly, in the big picture, if Randy had not changed his mind to go to the WWE instead of coming to Mid South Wrestling. Cowboy Bill Watts, Mid South’s owner, and Savage had come to a verbal agreement for Randy to become a main eventer for Watts. We had Savage TV vignettes done and ready to air but it was not meant to be. Randy Savage had a style unto his own. I am proud to have worked alongside "Macho Man" Randy Savage, though I never understood him. As a wrestling fan, I marveled at his madness inside the ropes and was uncomfortable of his madness outside the ring. It is said that after Randy married his childhood sweetheart that he mellowed and enjoyed his life in Florida in his latter years. We never had that final sitdown of which I regret. Perhaps some day in another place. The WWE got it right and Randy Savage is going into the WWE Hall of Fame, where Randy’s spirit has resided since his passing. My congratulations to the Poffo family, Randy’s friends and fans. Enjoy this Hall of Fame moment for the Macho Man . . . OOOOH YEAH!! !